Do you ever watch America's Next Top Model or fashion shows and wish that it could be you up there? Well, all my life that's all I've ever dreamed of. 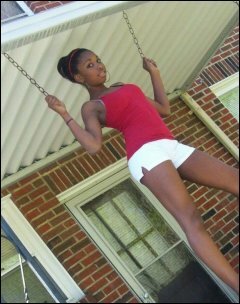 Since I could walk and talk I've been wanting to be a model. I remember putting on my dress-up princess heels and walking up and down the hallway practicing my runway walk. If this reminds you of yourself, then why haven't you done anything about it? Since I've had a MySpace account I've been site modeling for layout sites. This means that they use my pictures for their signs, support codes, layouts, etc. 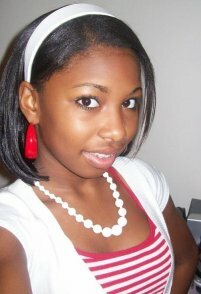 It gives me some experience in the modeling field because I have to take pictures to fit that site's needs. (You'll occasionally see me in Sweet Designs Magazine.) You might want to try site modeling also. A few months ago, I was at my local mall and I saw an ad about a spring fashion show. I found out all the information and applied to be in it. This was my first fashion show, and I had so much fun. Of course, I didn't get paid, but I modeled for Wet Seal and David's Bridal, and it was a blast! I loved the feeling I got while I was on the runway. At that moment, I knew it was what I wanted to do. So I applied to some different agencies online including Ford Models, Elite Model Management, and Barbizon. I never expected to get a call because I didn't think they checked those things. But about two weeks ago, a lady named Judith from Barbizon called and told me she was flying in from Florida to hold auditions and she wanted me there! I was so excited!! This past Saturday, I dressed casually and in heels and took along a photograph, and I went to the auditions. I didn't expect so many girls to be there! There were over 400, and only 30 were to be chosen! I started to lose faith, but my mom encouraged me. During my interview, the lady kept saying, "... and when we call you to tell you that you made it ..." so I had a feeling they were going to call me. I felt really good leaving my interview. Two days later, I got the call! I started training the following weekend. So here's my point: If you're trying to get into modeling, don't just sit around waiting for someone to magically discover you. I doubt it will happen. ♥ Apply to some agencies. Along with your mom, find out all you can about them. Some are reputable, while others are not. Check your local agencies if you have any. ♥ Practice your runway walk. Watch America's Next Top Model, because the tips they give really help. ♥ Practice by site modeling for SDM and other sites. ♥ When a photographer, runway coordinator, agency boss, Stephanie Lynn, or whoever is directing you gives you instructions or an assignment, listen up and follow through! 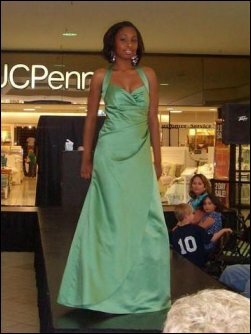 ♥ Find out about local fashion shows like the one I did at the mall and apply. I hope my article helps you follow your dreams!